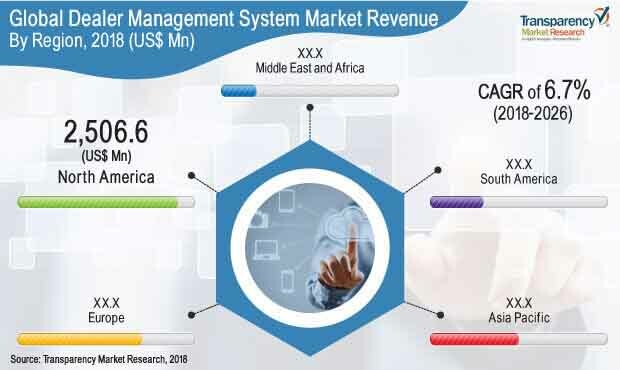 According to a new report on the dealer management system marketpublished by Transparency Market Research, the global dealer management system market is expected to reach a value of US$ 10,769.4 Mn by 2026, expanding at a CAGR of 6.7% from 2018 to 2026. According to the report, the global market is projected to continue to be influenced by a number of macroeconomic and automotive industry-specific factors. In terms of application, the transportation & logistics segment is anticipated to expand in the coming years. Demand for dealer management systems has increased significantly in recent years. The transportation & logistics, marine, and construction sectors are prominent users of dealer management systems. The demand for dealer management systems in the transportation & logistics sectors is expected to rise during the forecast period. There has been a substantial increase in the deployment of dealer management systems across the automotive sector. This is attributed to the advanced features of the dealer management system to effectively manage operational issues in the industry. Demand for dealer management systems is anticipated to be significant in marine applications. In the transportation sector, the demand for cloud based dealer management has increased over the past few years, especially within airports. The trend is expected to continue during the forecast period. Fleet management is gradually shifting to a technology-driven market. Adoption of fleet management software for data management and analytics has been rising. Further, technological advancements are expected to introduce new technologies such as connected vehicles and autonomous cars. The technology that gives rise to this new breed of vehicles is anticipated to re-shape the dealer management system market. This paradigm shift would also affect roadways, fleets, business models, and drivers. In terms of region, Asia Pacific held a prominent share of the dealer management system market in 2018. North Americaconstitutes a key market share, and the market in the region is anticipated to expand at a robust pace during the forecast period. The market in Middle East & Africa and South America is expected to expand at a steady growthrate as compared to the market in other regions of the world. The global dealer management system market has been segmented based on deployment model, application,and geography. Demand for cloud based solutions is expected to rise significantly during the forecast period. Further, in terms of revenue, on-premise deployment model is anticipated to grow during the forecast period. Increase in investments from OEMs is anticipated to create new opportunities for the dealer management system market globally. Rise in adoption of fleet management analytics is a key factor driving the growth of the dealer management system market. Asia Pacific and North America are expected to propel demand for private cloud based solutions over the forecast period. Demand for cloud based solutions is projected to continue to be significant in the transportation & logistics sector. In terms of revenue, the global dealer management system market is primarily driven by the North America region. North America constitutes a prominent market share, followed by Europe, Middle East & Africa, and South America. The U.S. contributes significantly to the market in North America due to the presence of logistics companies and DMS vendors. Increase in advancements in connectivity technologies and rise in the number of vendors of dealer management systems are expected to drive the market in the U.S. in the near future. In Middle East & Africa, GCC is the leading sub-region of the market, followed by South Africa. Middle East & Africa is likely to be an attractive region for the market with investment opportunities for companies. In South America, Brazil is the leading economy driving the dealer management system market. The research study includes profiles of leading companies operating in the global dealer management system market. Market players have been profiled in terms of attributes such as company overview, financial overview, business strategies, and recent developments. Some of the key players in the market are Adam Systems, BiT Dealership Software, Inc., Blue Skies Business Solutions Inc., CDK Global, LLC, Dealertrack, Inc., Elva DMS, Excellon Software Pvt. Ltd., Gemini Computer Systems Ltd, Ideal Computer Systems, Irium Software, PBS Systems, Inc, Quorum Information Technologies, The Reynolds and Reynolds Company, Velosio, and XAPT Corporation. Market leaders are focusing on expanding their business by developing strategic partnerships and offering innovative solutions to end-use industries.